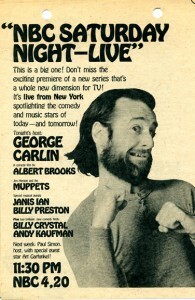 When Saturday Night Live premiered on NBC, it included a puppet segment called The Land of Gorch which featured a new group of characters from Jim and his team. 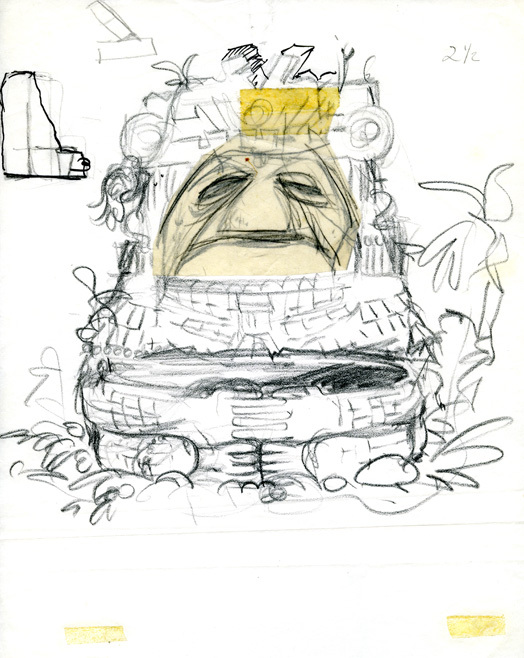 Scred, King Ploobis, Queen Peuta, Vazh, Wisss, and The Mighty Fuvog, designed by Michael Frith, had a more naturalistic look, with taxidermist eyes, and were meant to be edgier and more adult that what was then occupying much of Jim Henson’s time, Sesame Street. For Jim, it was a return to the late night television audiences that he had entertained in the 1950s with his Washington show Sam and Friends and an opportunity to remind people that his work was not just for kids. The creators of SNL were young, creative and mildly subversive – a seemingly perfect fit for the Muppets. The scripts were written by the SNL staff with Jim’s input and brought to life by the performers: Jim, Frank Oz, Jerry Nelson, Dave Goelz, Alice Tweedie, Rhonda Hansome, and Richard Hunt. While most of the bits were self-contained, some of the most memorable moments were when the characters interacted with the guest stars, like when Jerry’s Nelson’s Scred sang “I’ve Got You Babe” with Lily Tomlin. When the Muppets left SNL the following year to start The Muppet Show, many of those guest star and cast member connections paid off – Lily Tomlin, Candace Bergen, Dudley Moore, Paul Simon, and Gilda Radner all appeared on The Muppet Show or Muppet specials. 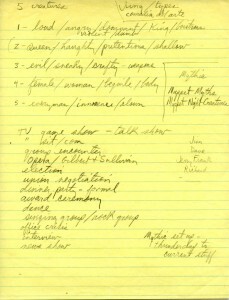 Jim Henson’s development notes for what he might do on Saturday Night Live, 1975. 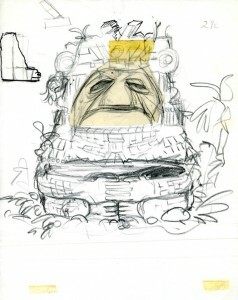 Jim Henson’s sketch of The Mighty Fuvog’s face overlaid on Michael Frith’s design for his body, 1975. TV Guide advertisement for the premiere of Saturday Night Live October 11, 1975. 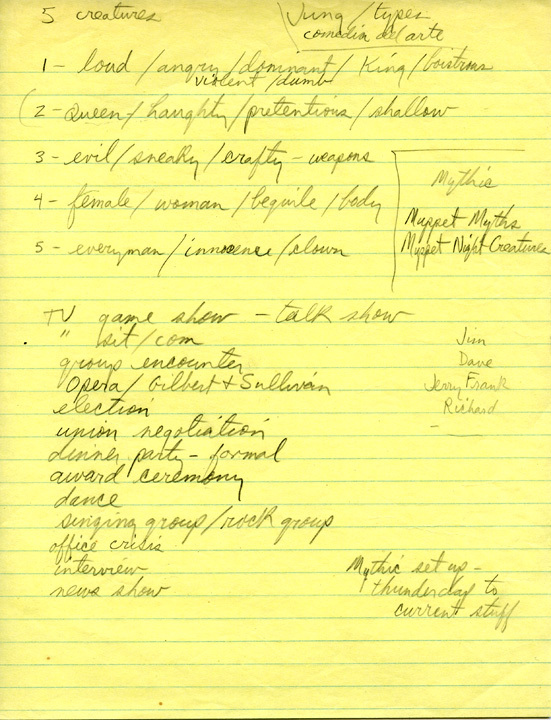 This entry was posted in 10-October '75, 1975, Saturday Night Live and tagged Frith, Fuvog, Goelz, Gorch, Hansome, Hunt, Nelson, Oz, Sred, Tomlin, Tweedie. Bookmark the permalink.